So far this year, the United States has seen 18 school shootings, 8 of those school shootings have resulted in a death. What can be done to stop this happening at schools our children attend? What does Family Watchdog suggest to keeping our schools safe? Family Watchdog suggests talking to your children. It's a tough subject now. But it's something that should be brought up with all children in school: What to do if an active shooter is on campus? How should your children respond? Keep your private guns locked up and put away where they cannot reach them. Children are easily infulenced by friends - I wonder how many weapons are obtained by school friends for another friend who would normally not have access to firearms. I know many of us parents do not like our children having cell phones. But after watching the recent school shooting in Florida on February 14th this year, I cannot help but feel how helpless those parents felt when they could not get in touch with their kids while they were still in the building. A student with a cellphone should always have their phone on silent. But if there was a school shooting, wouldn't you want to be able to contact your child? Also, by providing your student with a cell phone, they can alert the authorities if they see anything suspicous. Talk to your school about a "hotline" they can set up for students to report possible bullying or shooter situations so they can anonymously report to an adult when danger may arise. Be active with your school. Talk to the principal or school board to see what their safety precautions may be for an active shooter. Make sure they are following correct procedures for all drills. Is there a way they can search bookbags before children arrive? Are there police officers assigned to your school? Teach your children bullying is not ok! If they see something, it needs to be reported! Work on improving mental health care. Its not new news that these shooters are mentally unstable. Maybe their parents did not see the bullying that went on in school? Maybe they did and tried to get the child help? One can only guess. But anyone who shoots up a school full of children has some serious mental issues. Start talking to your children to make sure they are ok. Make sure that they do not have harmful thoughts. If they your child does, or know of someone that does, they should be talked with. Report it to the school and make sure that everyone is doing everything they can to make sure that this person is not a harm to themselves or others. We are not going to go into the gun control issue. Everyone has their different views. Please do what you feel is necessary to keep children safe. Lock up all guns in your home. Whether you are pro-gun or anti-gun.... your guns should be locked up and out of reach of children. Have used your services for many years, really appreciate your organization...more now than ever as we strive to protect our congregation. Your article today says that there have been 18 school shootings this year. That is incorrect...There have been 3 school shootings this year that we would really classify as school shootings. The media is reporting 18, but that number includes suicides on school property, random off hour drive by shootings, accidental discharge in training facilities as well as other unique situations. 3 is too many...1 is too many...we have to change the way we protect our students now! Just wanted to give you a heads up on the inaccuracy of the 18 number. 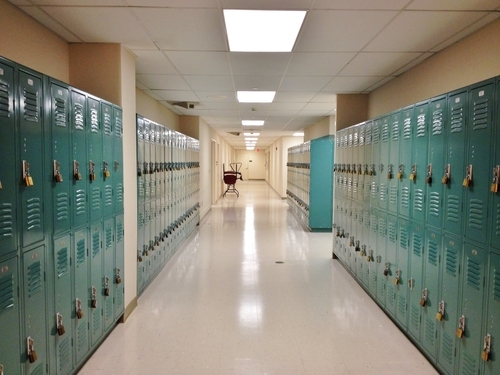 Every school should have a Metal Roll-up Door system installed above the classroom door and these can easily be pulled down to the floor and locked into place. There the same ones the Storage places use and they only cost about $200 a piece. They are not bullet proof but at least its a line of defense that would delay a shoter long enough for the police to arrive. There is also a metal door blocker that slips over the swing arm of the door and prvents it from being opened. I have a G license in Security which allows us Security Officers to carry a fire arm. The police have there hands full already. So I would like to see more Armed Security in schools. This does 2 things. (1) It will protect our children. Yes 1 child might lose there life (The Shooter) but it will help save others. (2) It will open jobs for good honest Americans. Everyday I put on my fire arm I know that I might not be coming home. I accept this because I took the responsibility of when I get that license I would protect no matter the cost. This is what we need. I would rest easier if I knew there was armed Security Officers at my son's school.